Thanks to Diamanda who kindly sent me a rip of this. 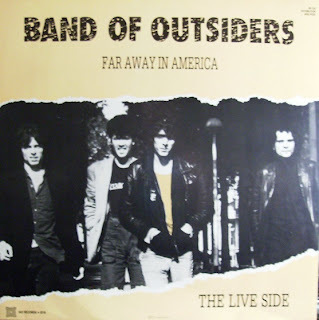 Band of Outsiders had already been performing in NY for a couple years when they teamed up with another of my favourites, Certain General, to record this Mini-LP. Originally on Sourmash in the US, it was picked up for release by "L'invitation au Suicide", the french label who would put out most of these 2 bands interesting work. The MiniLP is split in a studio and a Live side. The studio side brings nothing new: the songs would be released on the following studio albums. The Live Side is much more interesting: a ultra slow version of "Conviction" and a song that never (to my knowledge) made to vinyl: "Done Away". I would need the cover of this LP, as all I find is the Certain General side of the MiniLP. Since the Lp covers are awkward to scan, the best is to shoot a pic with a camera, I can always retouch it to make straight. I will shortly get into Certain General's first releases and start ripping them. Sometimes a lonely night is love itself to me.